Shawn Jasper at Hatchland Farm, North Haverhill N.H.
We talk with Shawn Jasper, the Commissioner of N.H.'s Department of Agriculture, Markets, and Food. A little over a year ago, Jasper handed in his gavel as Speaker of the New Hampshire House to head the wide-ranging agriculture department, which encompasses produce and dairy farms, farmer's markets, maple syrup and more. We find out what he's keeping an eye on as he assesses a changing agricultural landscape. 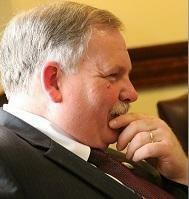 Shawn Jasper, Commissioner of the N.H. Department of Agriculture, Markets & Food. Jasper was a selectman in the town of Hudson for 17 years, and he served 12 terms in the New Hampshire House of Representatives. He was elected Speaker of the House in 2014, a post he held until his resignation in 2017, to become Commissioner of Agriculture. Pooh Sprague, Edgewater Farm in Plainfield, N.H.
Sam Canonica, Manning Hill Farm in Winchester, N.H.
Howard Pearl, Pearl & Sons Farm in Loudon, N.H.
Read about Shawn Jasper's Dairy Premium bill, that would promote N.H. milk with a “New Hampshire’s Own” sticker. The New Hampshire Department of Agriculture, Markets and Food wants to create a new label for New Hampshire milk to help keep local dairies afloat. Agriculture Commissioner Shawn Jasper is working with Gov. Chris Sununu and lawmakers on a House bill to create the program, called the Dairy Premium Fund. The Speaker of the New Hampshire House is looking to put down his gavel to lead the state’s agriculture department. Although it may be an unusual career move, Speaker Shawn Jasper says he’s been eyeing the commissioner's job for a while. Jasper grew up in a family of poultry farmers. His grandfather and father bred chickens for nearly 75 years in Hudson - producing more than 160 million eggs. Jasper says he’s continued to keep up on agriculture issues over the years through the legislature and as a nearly 30-year advisor to UNH's agriculture fraternity.